Thursday 29 November Facebook alerted me that I had enrolled for the Service Design Breakfast at Otaniemi. So, it was time to print out the tickets and head for the Aalto University, formerly known as TKK campus at Espoo. I arrived at Aalto University’s Start Up Sauna and after a freebie breakfast it was time to listen up the presentation of the day. This time it was Jouni Tuominiemi from HIQ discussing about Elearning and service design. The actual topic was “Service acceptance boosted by e-learning”, an hour long presentation and discussion about how Elearning can be utilized when implementing new services on market. Hiq is an IT and management consultancy firm situated in Sweden, Denmark, Finland and Russia. They have over 1200 professionals working for them and profess to follow mantra about their goals: Quality, Profitability and Growth – in this order. Jouni started with the basics of Elearning and outlined how it has changed over the years. If once upon a time it could have been regarded as a form of self-study, this is not the case anymore. With the help of social media and other improved communications method teachers can keep tabs on student much more effectively that before. 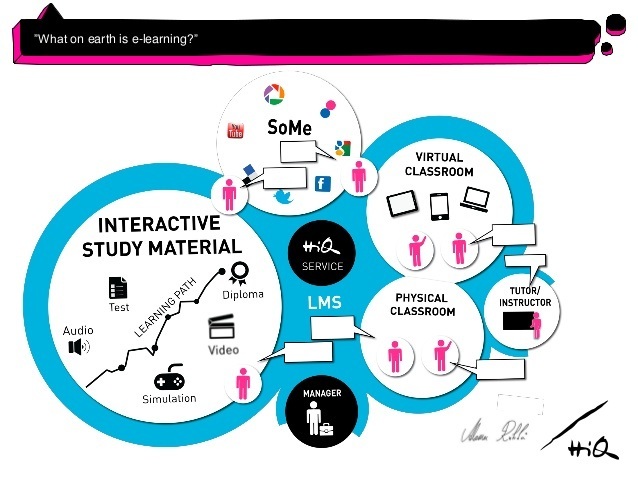 Picture above is taken from Jouni’s presentation and is meant to visualize the Elearning of today. According to Jouni Elearning is needed because not every service is simple and easily understandable. This is true especially when services have been intended to professional use. The amount of critical features and connections to other systems and processes inevitably means more complicated offering that takes time to master. In this situation service design professionals are left with choice where to spend their money: Either for oversimplification of the service or creation of comprehensive learning material for prospective users which will help them to master the service in more efficient way? However it is also important not to get overboard with Elearning material. It must be understood that Elearning is just a cost effective tool which offers additional help for users, not an excuse to skip Service Design when planning for new services. Jouni emphasized that especially in a launch phase of new services Elearning can be a valuable help. It is important to introduce the material well in advance so that users can get to understand the service and its most important features. If this is not done the situation can be difficult to remedy later on. Jouni agreed with authors such as Moritz and Stickdorn & Schneider that no matter how good the material is it no substitute for exploiting company employees and stakeholders in design phase of new service to the fullest of their capacities. Only this way useful services that add value to all can be designed and implemented. Jouni didn’t specially mention it but Elearning is also a perfect way to improve Technological Readiness (TR). When Elearning is extensively used before service launch and wide array of tools is also used afterwards this can only lead to an improved user experience and lowered threshold for more people to actually accept and start using a new service. Something that has proved to be and still does from time to time is for HIQ and their customers to motivate end users to “Elearn”. This has been solved with many a different method over the years. Some people need a Diploma they can hang on the walls, others are after some sort of a prize. 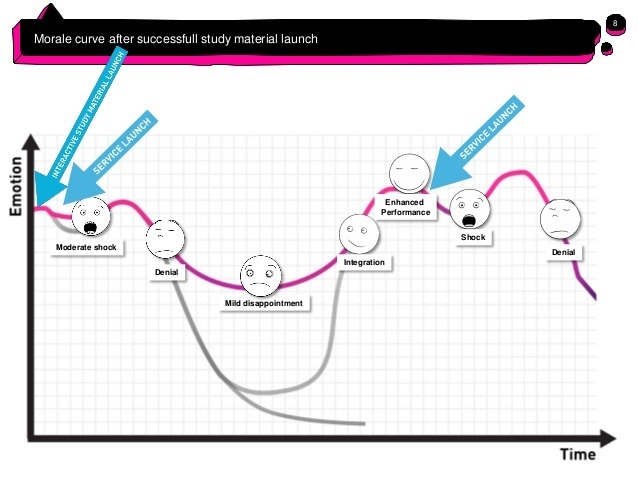 Other reasons for extra motivation can be as diverse as sneak preview, money and localization. Jouni talked a lot about using Elearning as a tool in order to launch new services or help users with the existing ones. What I actually missed were his views on Elearning as an independent service. How does HIQ develop Elearning for certain services? What is the development path for them and what service design methods they actually use when designing Elearning material? For me this is a pretty unknown area of expertise so would have definitely wanted to hear more his views regarding this. All in all this was a nice occasion, which gave much food for thought. My thesis discusses digital customer interfaces and one very important part of it is how to get more people to use it and what does it take to actually achieve this. Elearning is definitely one part of the answer although I completely approve with Jouni’s view that Elearning is not a substitute for a properly though of Service Design Process but a tool which complements it. If one of the greatest barriers for increased use of technology in services is the fear of new and complicated things then Elearning is definitely part on the answer.